The Ohio State University President Michael V. Drake announced an expansion of the university’s commitment to make college more affordable and accessible for students. While highlighting a historically successful year for Ohio State during his annual State of the University Address, Drake shared the addition of $40 million in need based aid for the 2018-2019 academic year. That includes $25 million to the President’s Affordability Grant program. Funding for the grants comes from administrative efficiencies. The grant program benefiting middle- and lower-income Ohio undergraduates is part of the university’s continuing focus on access, affordability and excellence. In 2017, Ohio State announced an unprecedented expansion of its efforts by ensuring all Pell-eligible students in Ohio receive an aid package that covers the full cost of tuition. Also last year, Ohio State expanded the Land Grant Opportunity Scholarship program to cover the full cost of attendance. Next fall, the university will double the number of students eligible for the program to two from each of Ohio’s 88 counties. “Through all of these programs, we will have committed $100 million in need-based aid for students and families since 2015 — exceeding our goal before 2020,” he said. 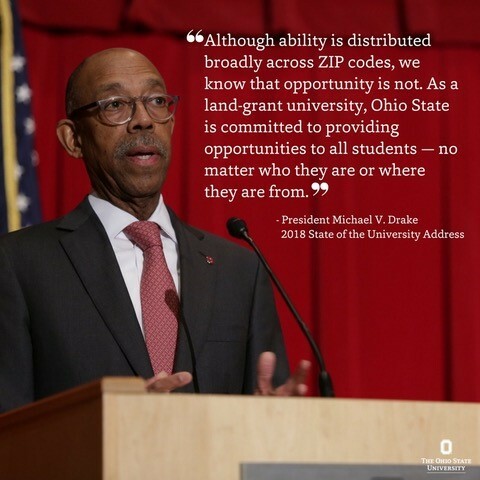 The commitment fulfills a promise Drake made at his presidential investiture in 2015 and follows a number of additional steps, including the Ohio State Tuition Guarantee that offers certainty to incoming students by freezing in-state tuition, fees, and room and board for four years. Ohio State was recently ranked by the Chronicle of Higher Education as first in the nation among flagship universities for efforts to control in-state tuition costs over the last decade. Overall, the address followed a year of historic highs at Ohio State. “The state of the university has never been stronger,” Drake said. He pointed to the fact that more students graduated from Ohio State in 2017 than in any other year in university history. More than 52,000 students applied to enter the class of 2017, also a university record. The new class set a record in academic talent and diversity – including historic highs in enrollment of Hispanic, Asian and African American students. The university’s research funding from the National Institutes of Health was up 9.8 percent and increased by 20 percent in the medical enterprise — particularly significant given that, nationally, the total NIH budget remained essentially flat. “We had our best year ever at the medical center for patient care and clinical excellence – with records in hospital admissions, outpatient visits and a very significant increase in the number of transplants we performed,” he said. Drake pointed to two first-of-their-kind initiatives to highlight Ohio State’s innovative leadership as a modern land-grant university: the Comprehensive Energy Management Project and a partnership with Apple. Through the energy management project, the university launched an aggressive effort to become more energy efficient and simultaneously invest in the academic mission – this investment is what made expanded tuition support for Pell-eligible Ohio students possible. “The Comprehensive Energy Management Projects marks the single largest investment ever in the university’s academic mission,” Drake noted. Ohio State also will become the nation’s first Digital Flagship University by partnering with Apple to bring more learning technologies into classrooms and offer training for students, faculty and staff. In 2017, Ohio State also announced a long-term physical plan for campus. Framework 2.0 is designed to address the needs for the university’s academic, teaching and research spaces with a focus on transforming natural systems and open areas. Proposals in the plan, guided and informed by the overall strategic vision, include an arts district, interdisciplinary research facility, an interdisciplinary health sciences center, and state-of-the-art hospital and ambulatory facilities. Drake also said the committee reviewing the university’s General Education Requirements will announce the results of its work later this semester. The goal of the committee is to ensure undergraduate students are effectively prepared for the 21st century workplace. Drake ended the address with a call to action. “To be successful in this next bold leap in our history, we need the talents and contributions of all members of Buckeye Nation,” he said.